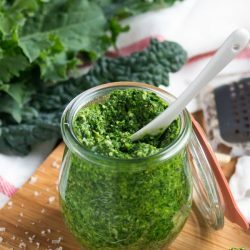 Spicy Kale Pesto is the perfect way to use up a large amount of kale. It is delicious stirred through pasta for a quick meal, served on crackers for a healthy snack or simply eaten straight from the spoon. Place the blanched kale into a food processor and blitz briefly, until the kale is finely chopped. Add the remainder of the ingredients and blitz until well combined. Taste the pesto and add additional lemon juice, salt and pepper if desired. Use immediately or store in glass jars in the fridge for up to one week. * Replace the blanched kale with a bunch of young, fresh kale. Blitz the young kale leaves straight into the pesto. Store leftover kale pesto in the fridge for up to a week, or freeze it for up to six months. This pesto is quite thick. If you prefer a runnier consistency, add a little more olive oil. If stirring this pesto through pasta, reserve a little of the cooking pasta water to thin out the sauce and help it coat the pasta evenly. Try your kale pesto spread on crackers for a quick healthy snack. I have only added a small amount of chilli to this recipe. Feel free to add more if you want a spicier version.